Obesity is a huge problem, especially in the Western world, with two thirds of American adults being overweight or obese. Unfortunately, being overweight can cause many health problems, including diabetes, heart disease, and high blood pressure, and so it should be avoided. There can be many different factors that cause weight gain, including genetics, hormonal imbalances, and illnesses, but the overarching factor in most cases is lifestyle. 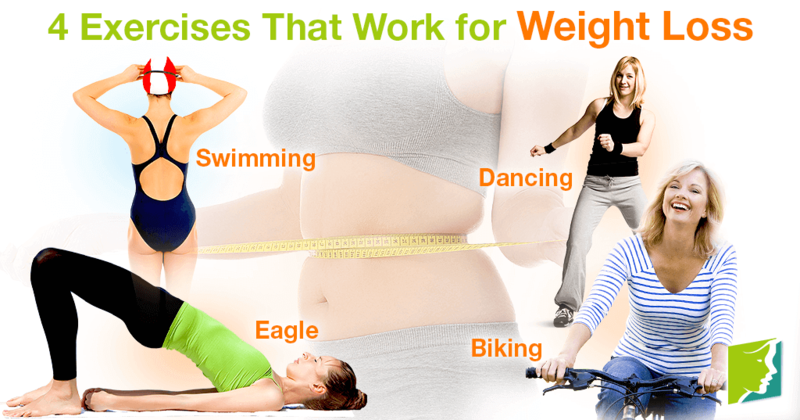 With a healthy diet and a good exercise regime, weight loss can be achieved. Read on for some exercises that work for weight loss. This one can be done at home whenever you have a spare half an hour. Lie on your back, bend your knees, and keep your feet flat on the floor. Spread out your arms to the side, palms facing down, and then exhale. Engage your abdominal muscles to keep the spine in place and then lift feet off the floor, making sure your knees are directly above your hips. Then bend them to a right angle and hold this position for as long as you can. While exhaling, raise your hips off the mat and gradually roll up your spine, ensuring that the angle of your knees does not change. As you inhale, slowly lower your spine and hips back to the original position. Being a low-impact sport, swimming is easy on the joints and bones. It is a great way to spend time with friends or family or it can be a solitary activity. Swimming develops strength and works your whole body, giving you a complete workout, and so it's a great way to lose weight. In the summer, swimming outdoors will also naturally boost your mood, as you will be getting the sun's rays, helping your body to make vitamin D, a natural mood balancer. Swimming can also be done during winter in an indoor pool, so you are not just limited to the summer months. Biking can give you a good cardio workout, and the difficulty level is completely your choice, so this exercise can be tailored to your own needs. The sport will naturally work your muscles, reducing fat stores in the body. It can also fit practically into your lifestyle, so whether you use it as a form of transport instead of taking the car or devote a whole weekend to riding your bike for its own sake is totally up to you. Incorporating exercise into your life in a fun way will increase the chances of you keeping it up. Dance can help to build muscle and increase flexibility. There are many styles to choose from, including jazz, ballet, and ballroom, so find which one works for you and learn how to dance! Gaining weight can cause a host of psychological and physiological problems and result in people feeling self-conscious to be seen in public. Making exercise a regular part of your life can seem like a chore, but there are many exercises, including the ones above, that can be an enjoyable experience. Click here to read advices on how to stick to an exercise program.